The importance of hob rake. In order to produce high quality gears, it is important to use hobs of AGMA Class A or better. Equally important, these hobs must be properly sharpened in order to maintain the correct hob tooth geometry. Improper hob sharpening introduces errors into the hob which transmit to the gear during hobbing. This will lead to lower quality gears. In this issue, we cover the effects of hob rake error introduced during improper hob sharpening. 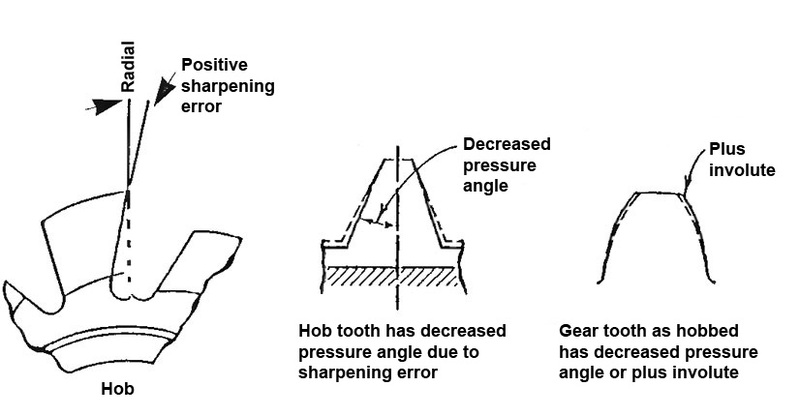 Rake error is described as the tooth face tolerance relative to the centerline of the hob which is measured from the full cutting depth to the outer diameter of the hob tooth. 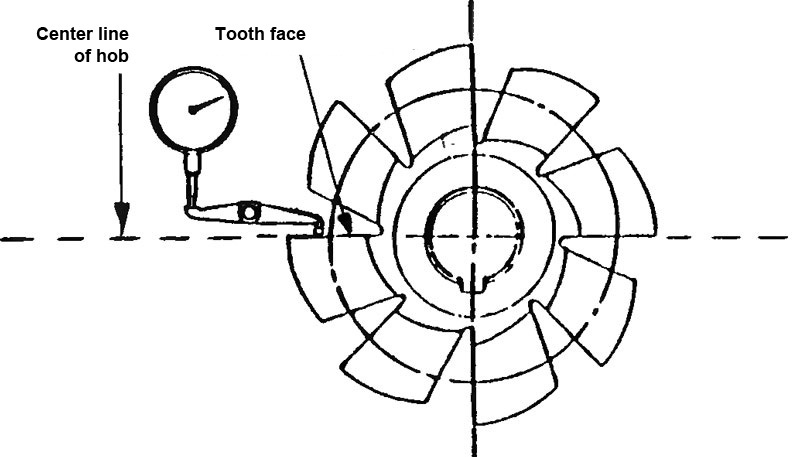 The tooth face of a hob with zero rake (also called radial rake) design extends on a theoretical line through the center of the hob (Figure 1). Most hobs are designed as radial rake hobs, but there are some applications where positive and negative rake hobs are used. Coarse pitch skiving (10 DP and coarser), for example, requires the use of a carbide hob that normally has a negative rake. When the hob is sharpened, the original rake angle of the tooth must be maintained whether it was designed with a positive, radial or negative rake angle. Figure 2 depicts a hob with a positive rake error. Excessive stock has been removed from the lower part of the hob tooth face. Since the hob teeth are cam-relieved, the depth of the tooth has increased. Also, the thickness of the lower portion of the tooth face has decreased. This decreases the pressure angle which produces an incorrect involute profile when hobbing a gear. A decreased pressure angle produces a gear tooth with a plus condition toward the tip of the gear tooth. This type of condition is undesirable and may cause gear noise and premature failure. In Figure 3, a hob is shown that has been sharpened with a negative rake error. Negative rake error is caused when the grinding wheel removes excessive stock from the upper portion of the hob tooth face. The depth of the hob tooth has now deceased, and the pressure angle has increased. This enlargement of the pressure angle makes the hob tooth thicker towards the root, which produces a relative minus condition toward the tip of the gear tooth. Rake error is usually caused by an improperly positioned grinding wheel or an incorrectly dressed wheel. To correct the rake, the grinding wheel can be repositioned axially on the hob sharpener. If necessary, the dresser may need to be adjusted, as well. Figure 4 shows the related section of the ANSI/AGMA 1102-A03 Tolerance Specification for Gear Hobs. For a fine to medium module, 0.63 to 2 mn (12.7 to 40 DP), class AAA hob, the maximum rake error would be 7 µm (0.00028”). By maintaining the rake error on your hobs within this tolerance, your gear involute profiles will be controlled.